Optum Pro Cycling presented by Kelly Benefit Strategies has announced its complete roster for the 2015 men’s team. The team retains the core of its UCI stage-winning leadout train from 2014 while adding five talented new riders, including two World Tour standouts. Cannondale Pro Cycling’s Guillaume Boivin (CAN), and Garmin-Sharp’s Phil Gaimon (USA) highlight the new signings, returning to race primarily in North America with Optum p/b KBS after spending last season at the World Tour. Pierrick Naud (CAN), Michael Woods (CAN), and Curtis White (USA) round out the final selection for the team’s 14-man roster. Nine riders return from last season’s record-setting team, including Ryan Anderson (CAN), Jesse Anthony (USA), Brad Huff (USA), 2014 Tour of California stage winner Will Routley (USA), Bjorn Selander (USA), Tom Soladay (USA), 2014 Tour of Utah stage winner Eric Young (USA), 2013 US Time Trial Champion Tom Zirbel (USA), and Scott Zwizanski (USA). Boivin, Naud, Woods, and Gaimon arrive with a long list of individual palmarés, while White’s professional career is just beginning to take shape. As has become tradition, the team will begin its 2015 season with a block of international racing, undertaking a multi-race campaign in Portugal following its Southern California training camp in late January. 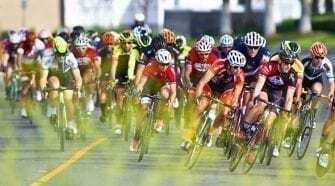 The campaign will feature the Volta ao Alentejo / Liberty Seguros stage race, as well as the Volta a Costa Vicentina, Cycling Portugal – Classica de Loulé, and the Grande Premio do Guadiana. The team again lists stage wins and overall standing in the UCI America’s Tour as primary goals. 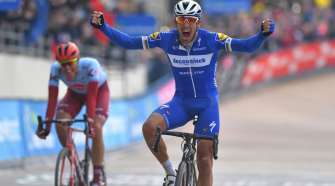 UCI stage races like the Tour of California, Tour of Utah, USA Pro Challenge, and the Tour of Alberta will feature prominently in the team’s preparations, as will defending its National Racing Calendar team title. The 2015 men’s team consists of entirely American and Canadian athletes – for the eighth consecutive season – a direct result of Carney’s focus on the development and support of North America’s significant talent pool. 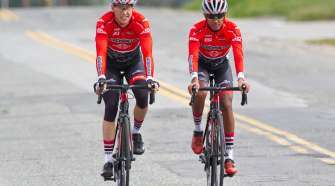 The uniquely domestic roster will again make the US and Canadian national championships a primary goal, with former national champions in the time trial, road race, and criterium disciplines hailing from both countries. The historic 2015 UCI Road World Championships in Richmond, VA could feature prominently in the team’s late season. With high standing in the UCI America’s Tour bringing with it an automatic bid in the world championship team time trial, another chance at the TTT on American soil is a highly enticing proposition for Carney’s new look 2015 roster.